Don't know where to ride? New to an area? The first thing I suggest you do is to take a look at the maps listed below. This will give you an idea of the offical routes that you have a right by law to use. You can only ride on roads, bridleways, byways and restricted byways, NOT footpaths (unless the landowner gives you permission). Buy an Ordnance Survey Explorer map of your area (orange cover), this will show bridleways as long green dashes and byways as green crosses. You can get these from a good newsagent or you can buy on line from http://www.ordnancesurvey.co.uk/. You can even buy a map that is centred on your house. These maps are not however always 100% up to date as additions can take years to find their way onto the offical maps. If you want to see the very latest rights of way you will need to take a look at the local definitive map of your area mentioned below. Your Parish Council and library should hold a printed copy of the detailed definitive maps of your area. These are very detailed large scale maps and they should have been kept up to date with all current changes. This website gives you access to ECC’s interactive map of public rights of way. Click here to view It shows the latest updates to the map and gives path numbers. To view public rights of way on the map, under “map categories” in the left hand panel, click on “assets”, then tick the box against “rights of way”; they will now all show on the map. You can search the map by various methods including postcode and parish name, or just by zooming in to the area you want to look at. Left clicking on a path brings up an information box which will tell you the parish and the path number, and its classification (footpath, bridleway, byway). These are rights of way that farmers have been paid under a special DEFRA scheme to provide. Don't get too excited as they are very few and far between and do not get very well advertised. To see if you have any in your area take a look at the DEFRA web site http://cwr.naturalengland.org.uk/Default.aspx?Menu=Menu&Module=CountryWalksFullSearch. These include walks as well as rides so be careful to check the legend to make sure it has the horse symbol. The routes are well marked on the ground and there is usually a map of where they link to other bridleways in the area. 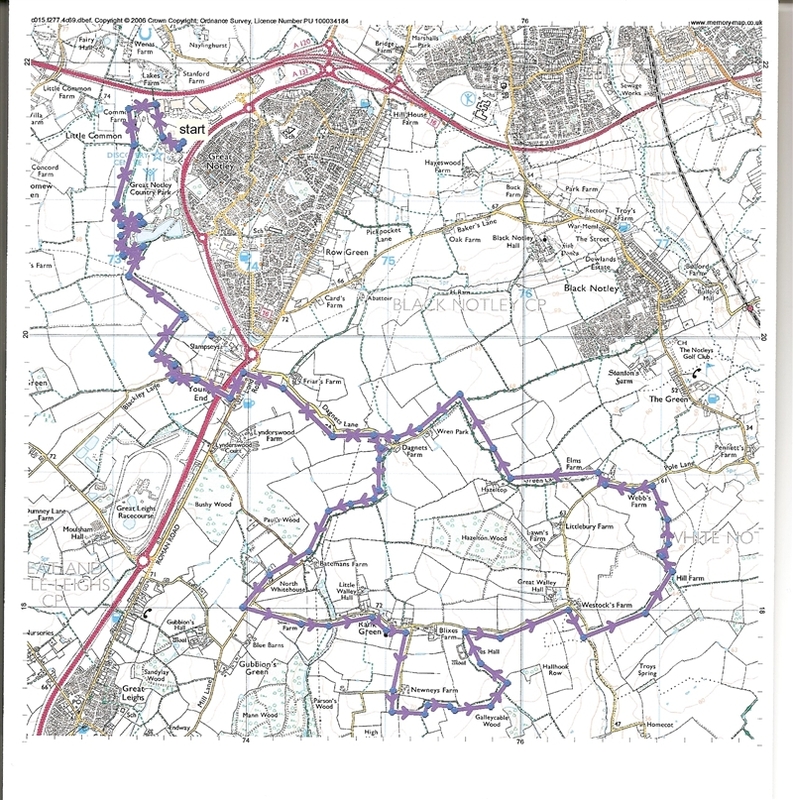 DEFRA are not renewing any agreements or creating any more so these permissive routes will gradually be phased out. Oh well it was good while it lasted. Berwick Farm has changed hands. The new owners will continue to run the cross country course, and we hope they will also continue to allow "park and ride" as below; we will make contact with them soon to check this. Meanwhile we are not sure if the contact details below are still correct. We will post an update as soon as we know the information. Parking for horseboxes for hacking on the nearby bridleways and byways is now available at Berwick Farm for £5 per person. If you want to use the cross country course this will cost £25 per person (including parking). Please put money in an envelope with your name on and pop it through the door of the farm cottage. Please be respectful and pick up any droppings or hay before you leave. Click here for directions to start and more info. Parking charges apply. This ride is on a total of about 13 miles of surfaced bridleway along part of an old disused railway line. This is a "there and back" ride with a possible refreshment stop at a pub half way. Please note that the route includes a long (safe) bridleway bridge over the A120. Some people find the surface a little hard but it is a good ride to do in the winter/autumn when everywhere else is knee deep in mud as the surface stays good all year round. Click here for a map of the route. This ride starts off around the park and then out into the countryside of Great Notley. About 50% of the ride is on minor roads. The rest is on byways and bridleways. Click here for map of route. Directions to start for both - Parking at Great Notley Discovery Centre car park. Best to avoid on busy summer days as the Flitch Way is well used by walkers and cyclists. Parking available only on week days and non school holidays. Approx £5 parking fee applies. Open from the first weekend in April until the end of October each year. Off-road riding day tickets are available for the 12 miles of farm tracks with shorter options available, private roads, grass gallops, seawall and optional cross country schooling fences from 1'6" to 2'9". Very flat and open so not good on a windy day but great if you like long canters and jumps. Horsebox parking, water and toilet facilities are available on site. A booking slot will be required and maps provided. Under 16's must be escorted by an adult. Directions – Middlewick Farm Livery Yard, Middlewick, The Marshes, Southminster, Essex CM0 7JQ. Approaching Southminster on the B1018 drive straight through the town and out the other side heading towards Montsale. Follow this road for about 2.5 miles until you reach a sharp right hand bend in the road. Do not go around the bend but go straight ahead through the metal gates. Follow this track for about a mile, around a left hand bend until you reach Middlewick Farm.The metal gates are normally locked so you need to call for an appointment - do not just turn up. Ride your horse in Hatfield Forest and enjoy the tranquillity and safety of this interesting and beautiful 1049 acre property. Follow in the hoofprints of the Norman gentry! Parking fees apply unless you are a member of the NT. For further details about an Annual Permit, please call the Estate Office. Day Permits are sold at the shop during normal opening hours as published in the NT Members' Handbook or at the web address below. Day permits not sold in winter. Terms and Conditions apply. This beach is one of the best beaches you can ever ride on; miles of flat golden sand with plenty of room for everyone. Riding on Holkham beach is permitted 365 days a year. Directions - Holkham Beach is on the North Norfolk coast two miles west of Wells-next-the-Sea. Parking at Lady Anne’s Drive, Holkham, Wells-next-the-sea, just off the A149 post. My sat/nav says M11, A11 to Thetford then pick up A134 to A1065 through Swaffham and Fakenham. Then east on the A148 for a short while to join B1105 (a slow drag), turn right onto the A149 towards Holkham. Lady Anne’s Drive is in the village of Holkham on your right hand side opposite The Victoria Hotel (Post code for hotel is NR23 1RG) . From the Bishops Stortford M11 junction 8 it takes about 2hrs 15 mins to get to Holkham. Parking - Horsebox parking is only allowed on the first half of the verges of the very long Lady Anne’s driveway so if it is wet turn around half way up the drive and park on the verge but with one wheel still on the tarmac. Horseboxes/Trailers parking is £12 per day. You will need 12 x £1 coins for the machines or a credit card. Tip – buy your parking ticket as you turn around as the ticket machines are half way up the drive and it can be a long walk back to them. Before you plan your trip phone the coastguard (01493 841300) or look up the tide times on-line and check for the time of low tide. You should aim to be riding on the beach just before low tide so there will be miles and miles of beach to ride on. If your horse has never seen the sea before they can be frightened by the waves rushing towards them; approach at an angle and/or ride parallel to it for a while. The sand is pretty firm, especially nearer the sea, but be careful, there could always be soft patches. Last time there were also some deeper inland streams which you would not want to canter through. Personally I would not gallop unless I had checked out the surface first. Once on the beach it is easy to lose track of where you are, keep a look out for landmarks. Please be courteous to other beach users and do not gallop close to them. The beach is huge so there should be plenty of room for everyone. Please wear your hi-vis on the beach as it makes it easier for everyone to see you coming and gives dog walkers a chance to get their dogs under control. Thetford Forest is a great place to ride as you can ride almost anywhere on lovely grassy strips between the trees. There are many separate parts of Thetford forest but the nearest part to Essex is Kings Forest. From M11 - On the map the most straight forward route looks like you just go up M11, A11, then A14 past Newmarket, back on A11 towards Thetford, then about 5 miles past the Weather Heath War Memorial (looks like Nelsons Column) take the next exit onto the B1106. CAREFUL - the exit is very sharpbend o exit road - you need to be in second gear. After exit turn left at juntion and follow for about 5 miles, go past fire road 201, the public car park is on the left opposite fire road 203 is where you would be able to park (gets busy at weekends and in nice weather). From A131 – to Sudbury, A134 towards Bury St. Edmunds, at Southgate Green take the 3rd exit on Rougham Road/A1302, go through 1 roundabout and then take 1st exit onto A14 ramp to Newmarket/Thetford/A134/Diss/A143. At junction 43 take the A143 exit to Bury St Edmunds, central/Thetford A134/Diss. At roundabout take 4th exit to A143, at next roundabout take 1st exit A134 again towards Thetford. Keep following the A134 and in the village of Ingham a few yards past the post office/village shop and red phone box turn left into Calford Road B1106. Follow for a few miles and then at the give way sign turn right and follow the B1106 through Wordwell, go past fire roads 206 & 204. The large public car park on the right opposite fire road 203 is where you would be able to park (gets busy at weekends and in nice weather). As a private rider you do not need to purchase a licence or pay for parking. You can access the forest directly via a path that leads out from the back of the car park. You are allowed to ride everywhere except in archery area and where notices say conservation ride.